Nathan P. Gilmour , 4 October 2013. There are all sorts of good things about defending one’s dissertation. I never have to correct a student again when he addresses me as “Dr. Gilmour.” I got a little pay bump each month. I look like a peacock at opening convocation and graduation each school year. (That’s what my department chair tells me, anyway.) But one of the little side benefits is that I don’t have to feel guilty now when I pick up a book not related to the dissertation. So over the last several months (it’s been a year and a half since I defended), I decided to start revisiting books that I’ve read before and shaped me as a thinker, both for the sake of the old times and to see if such books could stand up after a few years away. 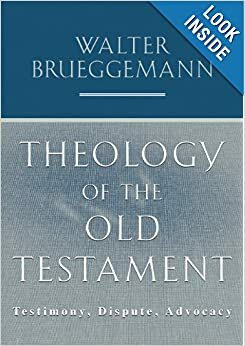 Walter Brueggemann’s big Old Testament theology, which I read as a seminarian in 2000, has decidedly stood the test of time. As I read it, slowly, each chapter reminded me just how much Brueggemann’s approach, emphasizing as it does the inherent plurality of the Biblical witness, has given me permission to be postmodern (even as THAT’s gone out of style) and faithful to the Bible, both a confessing Christian and someone who’s ready to listen to readings from beyond the walls of the seminary. I’ve certainly changed over the years, not nearly as ready as I was thirteen years ago to dismiss out of hand the grand complex project which is Platonic philosophy, but when it comes to how I teach and read and meditate on the Scriptures, I’m still a Brueggemaniac all this time later. I hope those of you who have read and enjoyed Brueggemann in the past will join me for this little stroll down seminary lane, and I hope that I can introduce some of the rest of you to a theolgian and scholar who has been a real friend in my journey, even though I’ve only ever met him once. Christian Feminist Podcast is on Stitcher!